1. The tournament is scheduled for February 23rd, from 12:00 noon until 3:00 p.m. on Grand Lake off the DNR launch on the south end of the lake. Contestants are discouraged inside fishing area prior to 9:00 a.m.
2. Should inclement weather cause cancellation on February 23rd, 2019, tournament will be held on February 24th, same time and place. Official cancellation notices will be posted atwww.icefishingalpena.com. 3. The top 30 place prizes are determined by largest weight and time registered. In the event of a tie, the first fish registered takes priority. Any size fish may place in the Top 30. Any open species of fish may be registered, the prizes place are determned by weight. 4. Each person will be allowed to fish one hole per ticket, three holes maximum. You may register as many fish as you want, but only the heaviest fish per contestant will qualify for a competition prize. No contestant will be eligible for more than one competition prize. There is no age requirement on tournament participation. All laws of the State of Michigan will be abided by. Contestants must fish in the contest area and use the holes provided. 5. Contestants may select their hole or holes no earlier than 9:00 a.m. on the day of the tournament. Selection is first come, first serve. 6. All fish entered must be brought to the weigh-in station immediately and be alive. Please bring a bag or bucket, as the tournament is live release. 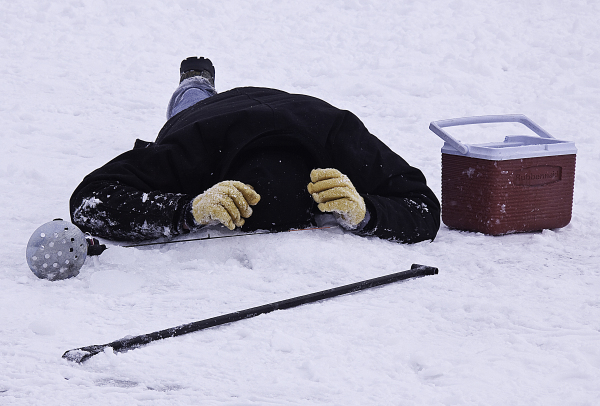 Dead or frozen fish are ineligible. Judges shall have the right to verify that fish were legally caught. The decision of the judge is final. Contestants are responsible for verification of weight of fish at time of weigh in. 7. All fish must be caught and the contestant en route to the weigh-in station by 3:00 p.m. on the day of the contest. 8. Contestants must fish in the area designated for the contest and will be required to have their tickets visible at all times. Ticket checks as well as container inspections will be required. 9. Contestants will be allowed to move to other unoccupied holes in the contest area. You are allowed to bring as many poles as desired, but cannot use more than one pole per hole at a time. Contestants must use holes provided and will not be allowed to leave the contest area between 12:00–3:00 p.m unless approved by gate officials and must re-enter through the inspection point. 10. Entry fee for the tournament is $25.00 for tickets. No refunds or exchanges will be given for any reason. 11. Contestants are responsible for their own safety, actions, and property at all times. Contestants and holes must be in plain view from all sides at all times. No shelters will be allowed. 12. All laws of the State of Michigan will be abided by. All contestants MUST have Michigan Fishing License and observe all fishing rules and regulations. 13. Contest prizes are the responsibility of the winners. Licensing, registration, transportation, taxes, and all incidental or consequential expenses incurred are the responsibility of the winners. Prizes must be claimed within 90 days of notification. 14. No motorized vehicles are allowed in the contest area other than those of contest officials and event personnel. Any contestant bringing a motor vehicle within 100 yards of the contestant perimeter will be disqualified. 15. Contestants are encouraged to park in the areas provided. Watch for signs. Contestants are encouraged to carpool and use the buddy system. There will be parking available at the DNR launch. Parking on the ice is at YOUR OWN RISK. 16. All bait fish must be six inches or smaller. Any bait fish over six inches will not be allowed on the ice. 17. Coolers and large containers are discouraged. No spears allowed. Heaters, chairs, and bait pails are allowed. Ice chisels are recommended as holes are drilled the day before. The use of augers is not allowed. 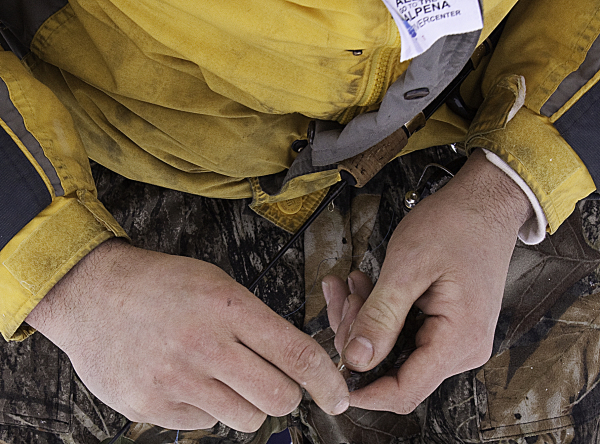 Weighted lines without hooks or bait can be used to check depth prior to 11:45 a.m. No electronics are allowed. No lines are allowed in the water from 11:45 a.m. to the start of the contest. 18. Anyone pre-fishing 24 hours before the contest must register with contest officials on-site. 19. Failure to comply with any contest rules subjects contestants to disqualification and removal from competition site, as determined by contest officials. Right to refuse to sell and/or revoke a competition ticket to anyone is hereby reserved. 20. There will be a leader board located in the contest area. All efforts will be made to keep the board up to date and accurate. Tournament results remain unofficial until verified by the head judge. 21. Members of the Wildlife Sanctuary Board and River Center Board are ineligible to fish the tournament. 22. All contestants and other spectators hereby consent to the use of any names, photographs or likenesses of themselves to be used in the promotion of our contest, including but not limited to print, radio, television, or any other media. 23. All fish registered have been legally gifted to the River Center. 24. The River Center would like thank you for supporting our efforts to protect the environment and request that you remove refuse—including cigarette butts—from the ice when you leave. Glass containers are not allowed in contest area and will be confiscated by and forfeited to tournament officials. Waste containers are provided. 25. All contest updates available and valid only from www.icefishingalpena.com.